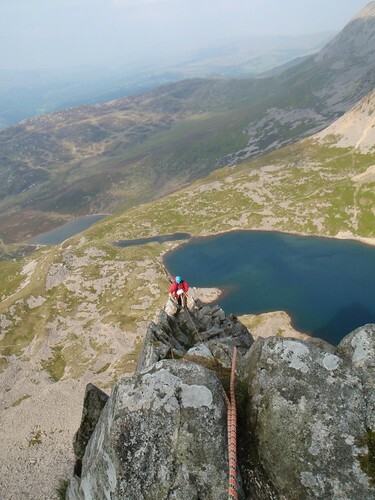 This amazing route (Cyfrwy Arete) presents the best experience scrambling can offer. It is graded as (scrambling grade) 3S, and we took a rope and gear. There is no doubt the experienced could do it without, but a consequence of a slip would be obvious. Scrambling is an activity that is often regarded as exciting, yet not as serious as proper climbing, and as a fantastic way to enjoy the great outdoor. Indeed a number of peaks, even within little Britain, are not accessible without scrambling, such as Crib Goch, which is a part of the popular Welsh 3000 challenge (and the race V3K Ultra). For many hill-walkers, it is only a natural progression to get into (easy) scrambling, arguably without any particular need of new gear or skill. But is it really safe, or safer than climbing? It is at best arguable. By definition, scrambling routes are technically easier than climbing ones. However, in climbing, climbers are usually well equipped with safety gear like a rope(s), slings, harness, and helmet, as well as sticky climbing shoes. Therefore, climbers are up for the challenge, and even if they fall, the consequence is usually not serious and no more than a hurt ego. On the other hand, scramblers often take no more than standard walking gear with big and non-sticky boots. The exposure is often no less serious than climbing routes — one slip can easily be fatal. Worse, the boundary between hard scrambling and easy climbing routes is very vague. Some scrambling guidebooks list routes at up to the climbing grade of VDiff. As a prime example, the first recorded scrambling route in the country, Broad Stand in Scafell, is situated in a fatally exposed position and is graded at Diff, yet is usually called a scrambling route (often given Grade 3 scrambling). Personally I have recently experienced one of the worst falls in my life, while scrambling up, falling and tumbling off for 20 meters or more in a steep rocky gully. I was incredibly lucky to survive and without major trauma. Technically it was many grades easier than my climbing grade. Yet, the wet conditions on the day and inadequate gear (no rope, gear, climbing shoes) made me slip, when the vegetated footing collapsed. A climber friend of mine said on a wet day he would rather go for climbing an E4 than for scrambling. That certainly makes some sense. I am not intending to put outdoor enthusiasts off scrambling, but am arguing scramblers should be well aware of the risks involved and should take necessary precautions, as well as assess the risks wisely. Now, let's go back to the basics. Here is a list of safety tips for scramblers, from beginners to experienced. Choose the right route. Don't jump into a hard route straight, which may well be beyond your ability. They may entail a more risk and difficulty than you may think. Get fit. In short you must be fitter than most walkers. After all, your chosen way is tougher than hill-walking routes! Fatigue is the root of all the risks in scrambling. Get the navigation right. Always make sure you are on route. Any routes are almost by definition easier than any of its immediate neighbours, and so if you go off-route, you will have a tougher (more dangerous and unpleasant) time. Do your homework about escape routes in case things go wrong. That may often mean you will retrace the route you have climbed up. As they say, 80% of whether you succeed or not is determined before you leave. Prepare well, and you will be fine (in most cases). Make an early start. It always takes longer than you think. With an early start, you are more likely to finish a day before the weather goes downhill or before the sun goes down. Plus, you are less likely to meet a cue. Make sure to pack the emergency kit like a group shelter, let alone waterproofs and a headtorch. You may want to go light, but light is not always right. Scrambling usually involves a more risk than walking, and so by definition you have a more chance to need those kits. A great fun of gill scrambling. Water may pose an additional risk. 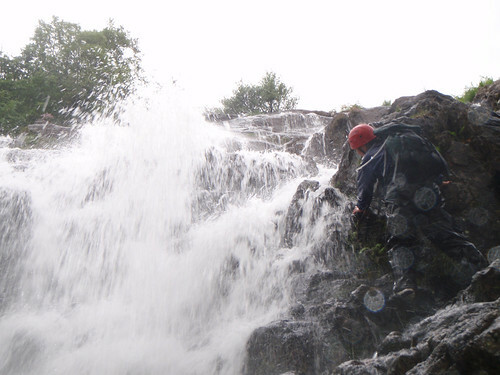 Gill scrambling can be a great fun, but be prepared it demands an appropriate skill, gear, and risk-assessment. Not to mention, water is an added hazard. Before pulling or stepping on a rock, make sure it is solid by testing each time or whenever you have the slightest doubt. Scrambling routes usually see less traffic than walking routes, and that means there usually are more loose rocks. Never rush in scrambling terrain. Unless you carry the appropriate gear like a rope and have the skill to use them, or unless you know the safe way out, do not clamber up something you can not reverse back down. Remember you may end up needing to climb down the way you have climbed up, because you go off-route, or the weather turns bad, or the route beyond turns out to be too difficult. Many people have ended up calling for a rescue after progressing irreversibly, or worse. Allegedly, Joe Brown has never climbed something he could not reverse in his entire career(!). To get familiarise with alpine-climbing ropework is highly recommended. No need to be able to climb hard (you would be a hero if you could climb Severe or F5). However, your knowledge about ropework must be far better than the average VS climber to be able to use a rope and gear safely and efficiently in scrambling terrain. Communication within your group is vital. Never leave any of your group member behind, and every one must be within sight. Make sure every one knows, and is happy with, what they are doing. If any of them is not, do consider an alternative. Plan for toilet well ahead. It can be not only awkward in a scrambling terrain, but also hazardous. Toilet-related affairs are ranked high as the cause of accidents in mountains. Eat, drink well, and be merry! All the photos are taken by the author and the licence is CC-SA-2.0 (click the CC mark associated with each photo for detail), unless otherwise noted. I have written the article "SKILLS: 25 Tips for Safer Scrambling Without Ropes", based on this with a considerable amount of brush-ups and additions, as published in UKH/UKC on 30 September, 2016.